I am shocked to learn that this monstrosity has Ralph Lauren’s name on it and even more shocked to learn that it sells for $10,500! This is definitely cheap Asian crap! Today we are going to discuss what went wrong, how that might have happened. Not Ted’s run-in with a way scary looking horns draped with crystal weirdness. But how to ensure that our dining room lighting is the right size! What style is your home? Is it traditional, contemporary, open plan? 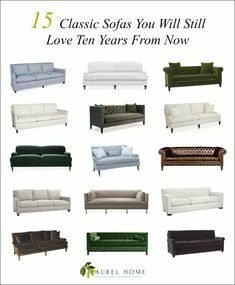 What style are your furnishings? Well, we might as well jump in here with pitfall number one. The online catalogs or even printed catalogs. This is the Paris Flea Market Chandelier by Visual Comfort and sold at many sources. From the images they look like big, medium and smaller, right? This happens ALL the time and many consumers don’t pay close enough attention, nor do they understand how to figure out what size to get. And the guides on the internet are also misleading. is to add up the width and length of the room and convert to inches for the diameter. So, a room that’s 12 feet x 16 feet would yield a 28″ diameter chandelier. And that might be a fine size for the room, but then there’s the table to consider. My rule is that the chandelier should in most cases be smaller than the table by about a foot. So a 42″ table = no larger than a 30″ chandelier. How heavy visually is the chandelier and what part is sticking out to create that diameter? For instance, one of my favorite chandeliers designed by John Rosselli for Visual Comfort has a diameter of 35″, but the only part sticking out are the candle holders, so the actual diameter of the ring is about 30″. 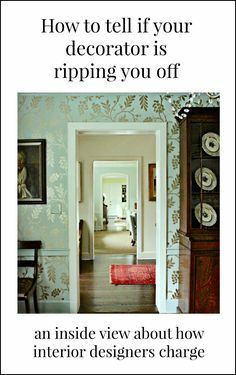 Plus, it went in a dining room with a super high ceiling when William McLure did it for the Southern Style Now Showhouse. As you can see, the size is perfect. 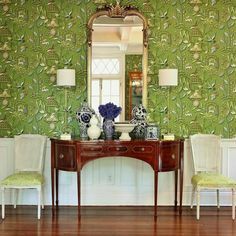 This is an incredibly charming dining room by Kim Bachman who is a dress designer, not interior designer. I adore this room, but technically, the chandelier is a little small and a little too high, too. How high should a chandelier be from the table? 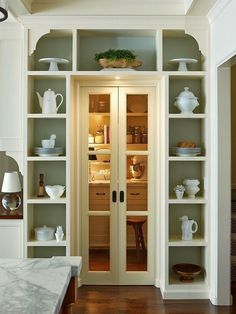 Usually, about 30″ above the table, but if there’s a piece that’s hanging way low like in this dining room (painted Farrow and Ball Chappell Green) below like in the pretty dining room above, it can be a little less than 30″. We must also consider the ceiling height and height of the fixture. The height of the fixture is always measured to the top of the part right before the chain begins. Usually, I think that there should be a minimum of one foot of chain. So, if there isn’t enough room for that, I would look for a shorter fixture. If the ceiling is higher than 8 feet, then it’s okay to add about three or four inches of height up from the table for every foot of height. So, if you have a ten foot ceiling, the chandelier might look best at about 36-38″ above the table. I always eyeball it with the electrician. I feel that it’s better to ere on the side of smaller rather than larger. However, some situations are safe to go larger and that is always going to be in a larger than normal dining room, say, 16′ x 24′ and/or a medium sized dining room with at least a ten foot ceiling. The Visual Comfort Gramercy Medium and Gramercy Large Chandeliers. In the photo, the medium seems rather petite and the one on the right fairly normal. Normal being between 27″-31″ in diameter. Well, wrong again. The one on the left is actually 32.5″ in diameter which is already pushing normal in my book. And the one on the right is 41.5″ which is not large, it’s GARGANTUAN for most dining rooms! That’s the chandelier that put the dude in the hospital! This piece is visually light, so that means that it’s okay to extend out a little as long as the ceiling height can support that size. In this dining area, designer Summer Thornton got it right with the medium Gramercy Chandelier. A couple of years ago, I had a long-distance consultation client who did this piece in a small dining area, but it is an old row home and the ceiling quite high and she was very happy with how it turned out. In this chic Brooklyn Home featured in Lonny – Designers, David Nastasi and Kate Vail created a breathtakingly beautiful dining room with the large Gramercy chandelier. The table looks to be nearly as wide as the chandelier, but all is good because of the great ceiling height. There are no rules. haha. But for most dining rooms with an 8 or 9 foot ceiling, a chandelier with a diameter from 24″ to 29″ is pretty safe. A few years ago, we did the Paris Flea Market Chandelier, the medium one which is 24″ in this dining room in Larchmont which measures 14′ x 20′– a good-sized room, but the ceiling is only eight feet. This fixture while having a lot of crystal, does have a fair amount of visual weight and the 24″ size was perfect. Sometimes, all that’s needed is a very small fixture. Another John Rosselli piece, this sweet pendant looks fabulous in this apartment kitchen we furnished. If one is doing a rectangular table in a dining room, then sometimes it’s wonderful to do either two lanterns or two bell jars. I love the Mykonos lantern. It is pretty large, however. Another Summer Thornton beauty. I didn’t realize this was her room, until I just went to fetch it from this post about how to avoid getting baby blue walls. These lanterns are about 17″ in diameter, so they would need at least a nine foot ceiling if going over a dining table. How do I know that? Experience, I guess. The Morris pendant also by Visual Comfort and designed by Suzanne Kasler has been getting a lot of press recently. I think it’s because it’s both classic and somewhat modern at the same time. Above is the small version which for most rooms I recommend. Robert Passal did this wonderful design. (BTW, I’ve met him and he’s super nice too!) with the Visual Comfort Morris lantern in the small-size and opaque glass. This is about a ten foot ceiling. So, if doing two, I think that it would be fine to do this size. Sometimes I’ve seen the larger ones and they look a little like a big medicine ball hanging from the ceiling. The scale thing isn’t easy, but sometimes if you do a google search for a fixture that you’re considering, you’ll find some images where it’s been done. Oh, and Circa Lighting finally has started a blog and has a lot of the images there as well. Geeezzz, even with this one room, I didn’t get to many of the things I wanted to, like other fixtures and other lighting, but this is already pretty long. Oh wait. I did want to add one more thing. Not the clearest shot, but my client in Bronxville, if you remember this mood board from a while back found this amazing Belle Époque Upside-down Wedding Cake chandelier. From this angle it looks a little imposing, but in the room, not at all. PS: Did you guys notice that I put up a new page with some of my favorite decorating and design books? It’s in the menu bar, but here’s a shortcut. That’s one great, great round up, Laurel. Really amazing, taking everything into account. What I had to figure out myself bit by bit as we had to fit all the new place with lighting by final inspection…it’s covered here. Truly impressive. Slightly envious of myself when I get to read your posts. Lol. OK, cheesy TV commercial reference. But seriously?? That was indeed a scary fixture! I did the Visual Comfort Branch Chandelier (the tall, rather than wide, one) recently for a client. She spied it on the Circa website, and wanted it because she’d never seen it used. Had to have it. Welllll…it kinda looks like big ol’ gilded iron antlers. I love a good Arte de Mexico antler piece as much as the next girl, used effectively. But one day just after all the lightning went into her guest house, a friend walked in and said, “OH–Antlers, I love it!” Sigh…. Eye-balling it works! Because you’re going… okay, it’s 36″… and because of experience, you know what that’s going to look like give an inch or two. I’ve been searching to no avail to find the perfect fixture to hang over the table in our eat in kitchen….with low ceilings. We’ve installed chrome with white glass fixtures in the rest of the kitchen. My husband is installing the final fixture in a hallway now as I type (I told him to yell if he needs my assistance. He did remember to turn off the circuit breaker). You’re in luck. I’ve already written a post about this subject because it’s a common one that a lot of people share. I pretty much always go with 30″36″ above a table. I like to see the chandy and the table as one scene, rather than have it so high it’s like a ceiling light. Obviously, a wider table or larger round one, can take a larger scaled chandy. And in double – height foyers, I like to see dramatic lights that will show through the window. You’re hilarious Laurel! Love your blog! The formula is primarily for dining rooms. It depends on if your entry is one story or two stories. Sounds like one-story. I also prefer semi-flushmounts. I did a post a long time ago about it. Well, I don’t think that there’s anyone making an orb that size. I do not know off-hand of any alternatives and wouldn’t make that in any case because I can’t give specific advice in the comments. Actually, it’s the other way around. RH knocks off other companies. In fact they were knocking off Visual Comfort that I frequently feature here because I love the line. But then what happened is that VC worked out a deal with RH and if you go on RH or VC (look at Circa Lighting) you will see some of the same fixtures. Hang on because that is next! And over the years have had to deal with that one numerous times. It is very common in these parts to have a kitchen, eating area family room as one room and then sometimes the dining room in clear vision. And sometimes the front entry. I’ve spent the past week making my way through your blog archives and I’ve learned so much! And laughed a lot, too. This post is especially timely, since I’m looking at replacing the gross builder grade light fixtures in my new house with prettier things. Not sure what you mean. There’s a sentence in front of a series of eight books which I did to break them up and also put more or less similar books together. Those aren’t links, if that’s what you’re referring to as subject headings. Well, I tinkered a bit and although Firefox does not let me see the books (even waiting a while) but Googgle Chrome does. Hoorah! Many thanks for looking into this and for all you do. I enjoy your site immensely!!! That is bizarre because I only use firefox on my laptop, so if I works for me. arrrggghhh… computers! But great thinking to check on a different browser. Maybe there’s a firewall on your firefox as it takes you to Amazon? But not important. Glad you got it to work and sorry for the difficulty. Thanks, Laurel! You’re the best! Now you have me wondering if the large Vendome chandelier I ordered for my dining room is the wrong choice. The room is 17 x 17 but the ceiling height is only 8′. I don’t think I have enough height. Yes, you need a minimum of 104″ with the Vendome. You could get away with 102″ but your ceiling is 98″ and it’s going to look too big all the way around. I went through the same thing with that fixture several years ago. It’s lovely, I just wish it were about 10% smaller. Actually, no. I learned NONE of this in design school. Three years as a full-time student. 72 interior design credits. What were we learning instead? Drafting and all of the technical aspects associated with it, perspective drawing, color, historical styles, space planning, detailed drafting, rendering, materials and methods I – an arts and crafts course and II a teach- more technical. Model making. But nothing about scale and proportion in design. Fantastic wall colour in your Apartment Kitchen, Laurel. Laurel, You crack me up! I love your blog! Ahh… yes.. these are all for a more formal dining room. (except for the one that is in a kitchen) I need to break this up because each area has its own issues and I didn’t even cover all of the dining room because I always think that there needs to be other lighting than besides a chandelier. I have a 20′ kitchen ceiling in an 18 x 19 kitchen and everyone’s first question is how are you going to light that?! My plan is hanging 3 orb chandeliers at 41″ diameter each.